The head of cartoon voice acting legend Frank Welker has been immortalized in a cameo appearance on Futurama. 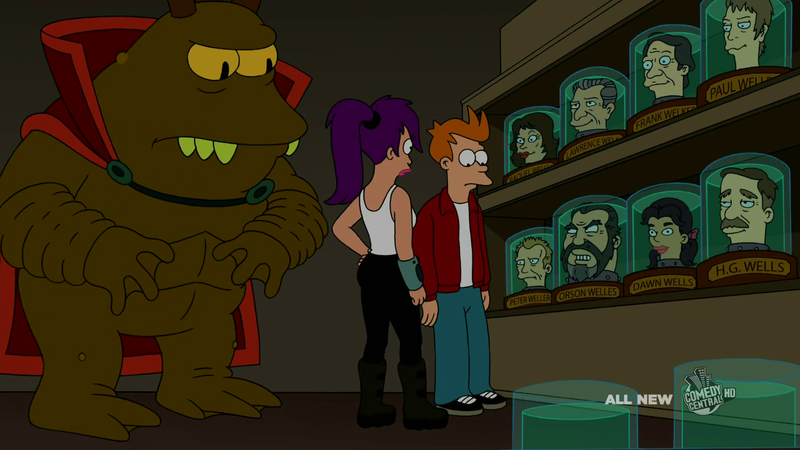 Frank Welker cameo on 'Futurama' along with (L to R, top shelf) Raquel Welch, Lawrence Welk, Paul Weller, (L to R, bottom shelf) Peter Weller, Orson Welles, Dawn Wells and H.G. Wells. Image courtesy of FOX and is used here for the purpose of commentary. 'Futurama TM and copyright FOX, its related entities and the Curiosity Company. All rights reserved. Futurama‘s Season 6 finale airs Thursday, September 2nd at 10 pm (EST) on Comedy Central. ComedyCentral.com also has web exclusive video interviews with Futurama cast members Maurice LaMarche, Phil LaMarr, John DiMaggio, Lauren Tom, David Herman, and two videos featuring Billy West here and here. There is also a video clip from the San Diego Comic-Con 2010 Futurama panel with a teaser on the season finale which includes guest voices Coolio and Al Gore, and special musical guests Devo (<–click for a preview). A very special thanks to Futurama fan “Bend-err” for posting this image at my request to the Planet Express Employee Lounge – The Futurama Message Board. You are currently browsing the archives for the Futurama category.